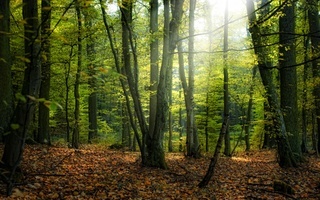 The Darkwood Forest is where the pack lives, with a large area of forest where prey is plentiful and the herbs can be found almost anywhere in any season. The pack's den is set in the middle of the forest, amongst the roots of large trees. The black and white male padded through the forest carefully. He could tell that he was close to the dens by scent. He watched a red and yellow mouse hide underneath the blue and black leaves. At least, that's what color HE saw. Bolt stood still, watching with a bored expression as bright, orangey red flames flickered and danced in front of him, bending at his control. He was flexing his skills, seeing how high and how hot he could make it without setting his surroundings on fire. The fire quickly went out, leaving a burnt spot where it had been, smoke rising from the earth, as the red pelted male heard pawsteps coming closer. He stood swiftly, taking a step forward while standing tall, ears perked forward and eyes curious. As Alpha, it was his job to make sure nothing dangerous came into the dens. He walked forward without hesitance, ready for something to come at him. Bolt's nose twitched as the scent of wolf entered his nostrils, yet it wasn't familiar. He only had to go around a tree before he found the scent's owner, a black and white colored male. Bolt didn't immediately attack the wolf, or respond with a snarl, he merely gazed at the male, a cautious look in his eyes, before speaking. "Hello, you are in the Darkwood forest of the heroes and legends pack, I am the Alpha male, Bolt. Name and business?" He stated, followed by a question, voice smooth and calm. Frostbit stared at the wolf for a moment. He'd never seen a wolf that glowed. He eventually had to look away, that was way to bright. "Are you okay?!" he asked as he lifted his head, though he had to squint. "And umm.. my name is Frostbite and I'd like to join.."
Bolt titled his head in confusion at the wolf's first words uttered, not understanding what could possibly lead the wolf to thinking that he wasn't alright. "Yes, I am very alright." He replied, huffing once quietly as he gave up trying to think of why this wolf acted so strange. He nodded slowly as the wolf introduced himself as Frostbite, and told him that his intentions were to join. He paused for a moment, ears flicking forward then back, before responding. "What skills do you have that can possibly help benefit this pack?" The male had to look away for a moment before looking back at Bolt. "Well it looks like your brain should be melting from your apparent extreme fever.." he said before clearing his throat. "I was one of the best hunters and trackers in my last pack." The confused expression returned to Bolt's face, mixed with slight start of irritation. Apparent extreme fever? He was perfectly fine, anybody could see that, even hear it in his voice. His lips twitched but they didn't pull back into a snarl. "I believe you are wrong, because I am just fine. No fever." He paused for a moment, listening, before nodding. They always needed good hunters. "Very well, then. You are officially accepted into the pack. I suppose I shall show you around, so follow me." He said, turning and walking away, long strides taking him far fast. Frost just shrugged "Fine, but you're like glowing." he said while he matched Bolt's stride. "Seriously. Your fur is like white." he stated. Bolt shot the male an irritated look at his words, the confusion slowly melting away, yet some still remained. "How does glowing, white fur have to do anything with a fever?" He questioned, curiosity no longer in his voice, yet he somehow managed to keep the annoyance out of it. "My fur is red, not white." He mentioned, wondering if perhaps the wolf was colorblind or maybe crazy. With a shake of his head he made it to the dens, stopping. "These are the pack dens. We sleep amongst the roots of the trees." He said before moving on, wandering where a wolf he knew was. Nova came from around the dens, his eyes scanning over the newcomer as he walked to Bolt's side. The red wolf was a bit hot to stand next to so he stood a bit away from him, he then looked at the newcomer which made him blink. This male was the same color as he was, in fact if this wolf was born to the same family he did this would be his brother. "Hey Bolt. Can ya turn down your flame a bit bud? Who's the newcomer?" The white and red wolf made his way, slowly threw the forest. He let his paws carry him where they wanted him to go, as he wasn`t in a so great mood. Colossith stopped and sat down as he felt fatigue threw his legs. He had walked for a few hours and he didn`t have much sleep lately. Was he even going too be able to sleep with what had just happened? He had been betrayed by his parents. The only wolves he could trust. Are others even trust worthy? he wondered. Was everyone just players? Pretenders? Colossith could still hear his mother repeat the same phrase over and over in his head. Each time he heard it in his head, it was as if he was being broken into several pieces. Was living even worth it? After all if he is death, he wouldn`t have to suffer. Colossith`s mind was disturbed as he heard some talking going on. He put on his serious look and looked around himself. Was he in someone`s territory? Whhere they going to judge him if they seem him? Colossith`s heart started beting quickly as many questions filled his mind. He was nervous at the thought of meeting new wolves. He was also afraid. Shaking his head in disagrement, Colossith stood up tall and walked towards the noises. He wasn`t going to show any signs of fatigue or nervousity. He had to look tough and strong, just like a male is supposed to do. After taking a few large steps, Colossith could see two wolves walking. He approached them, giving them a serious look. As he was approximately a meter away, Colossith looked at both of them and awaited their reaction. Were they going to laugh at him? It was unkown for now, but he is soon going to discover it. "Nope, you're so white that you glow." he turned towards the new male. "See! He's red and yellow like everyone else and you are white! It's magnificent! I've never seen anything like it before." Bolt looked relieved for a few moments as Nova approached, before the look of relief dropped and was replaced by another wave of irritation. "Turn down my flame? I am not controlling any fire at the moment!" He said briskly, feeling the white hot feeling flicker within him, making him stop immediately to take a deep breath. It was never any good when he started to feel his power surging, slipping out of control, and over simple comments, no less. He took a deep breath then released it slowly through his nostrils before he continued. He waited till after Frostbite finished speaking before he attempted to speak. "The newcomer is Frostbite, and I was just showing him around." He replied to Nova's earlier question before turning to address Frostbite, curious yet again. "Everybody is supposed to be red and yellow? What are you talking about?" Bolt questioned, ears flicking as he picked up the sound of pawsteps. Turning to see another wolf approach, one with white fur and multicolor markings, he stood tall, noting the serious look on the new male's face. "You are in the territory of the Heroes and Legends pack, I am the Alpha Male, Bolt. Name and Business?" He addressed the male, waiting for a response. Nova narrowed his eyes at the male named Frostbite then proceeded to roll them as he scented the other wolf coming close. A frown took its place on his face as he watched the exchange between the Alpha and the new wolf. He sat down next to Bolt and let him do his thing, at this time he wasn't needed. "Yes! Everybody is red and yellow! He's red and yellow, he's red and yellow, but you... are white.." he said, looking Bolt over. One of the male's smelled strangely familiar, but he paid no mind. Bolt shifted his weight from paw to paw as he awaited a response from the serious looking male, glancing back around the camp before turning his piercing yellow eyes to the male, wondering why it seemed so quiet. Inside he felt suddenly restless, like he wanted to run and jump and move about instead of staying still, particularly wanting to destroy something, claw at a tree, or sink his sharp canines into a creature's soft flesh. It was like an itch under his skin that he couldn't scratch. The young Alpha had the feeling many times before, mostly after the white hot feeling emerged and he didn't let it unleash, didn't lose control, and it started after he had discovered his power, a few days after his family had been slaughtered. Bolt was dragged from his thoughts by the already familiar sound of Frostbite's voice, and he directed his firm gaze on the male, expression leaning more on the blank side. He sighed inwardly, confused once again, but more curious then agitated this time as to what the male meant. He opened his jaws to speak. "How come you see everybody as red and yellow? Surely they are other colors,"
He stopped for a moment, tilting his head slightly in thought before continuing to speak again, voice full of curiosity. Bolt questioned, ear twitching as the wind blew by and tickled the fur inside his ear, ruffling his crimson pelt on its way past. Frost's ears lifted a bit and he had to flinch back and rub his eyes "Are you trying to blind me?" he blinked the spots out of his eyes and answered the alpha "There's pink, purple, orange, and blue. Black is what color the sky is, for it's neither cold nor warm." he stated. "You my friend are a glowing white.."
OOC: Hey, guys. Just gotta say that we need an Addressed and Mentioned for every post. Also, Frostbite, would you be able to make your posts a bit bigger? Thanks dear. "You are in the territory of the Heroes and Legends pack, I am the Alpha Male, Bolt. Name and Business?" the red wolf said. Colossith shook his head in disagrement. "I don`t care if your an Alpha...he mumbled. "You don`t need to know my name and business as it is none of your business. I know it might be your territory, but do I look like I even care about it?" Colossith said in a kind of sarcastic way. It wasn`t because the red wolf was an Alpha that he could interview Colossith with questions. Colossith looked up at the blue sky. He would most likely be useful in this pack, that`s for sure. He looked tough, strong and inteligent. Maybe this red wolf named Bolt was going to invite him as they seem to need him. What rank would he offer him, though? In Colossith`s old pack, he was just considered as a loner. He had been treated horribly which might influence his decision to join this pack. He didn`t want to live the same thing twice. These last few days he has been paying no attention at all about the past as it frightened him. The white and red spotted wolf glanced as one of the wolves through ridiculous comments on the way he was seeing us. Colossith`s eyes widden, but he looked away from this wolf as his only thought in mind at the moment was this wolf was certainly crazy or probably brain dead. Colossith looked back at Bolt and nodded slightly. "How did you even become Alpha male of these packs? After all as far as I heard, it seems that gaining land is awfully hard..." Colossith stated trying to start a conversation. Bolt seemed the only one normal to start a conversation with. For some reasons Colossith felt like ignoring the other two, as they seemed a bit too insane for him. Kimbra searched the world with her blue eyes. She could hear the voices of the pack. Trotting around the trees, searching for her fellow pack members, Kimbra was excited. Finally! I've been too lonely these past days! she thought. She approached the group who seemed faintly awkward and anxious. Bolt was there! She quickly ran up to him and quickly nuzzled him. He seemed curious about the wolf in front of him. "You are in the territory of the Heroes and Legends pack, I am the Alpha Male, Bolt. Name and Business?" he said. The wolf in front of him nearly rolled his eyes. He was quite a nicely presented wolf with a clean white coat, spectacular eyes and markings. "You don`t need to know my name and business as it is none of your business. I know it might be your territory, but do I look like I even care about it?" the other wolf said. Sassy much! "How did you even become Alpha male of these packs? After all as far as I heard, it seems that gaining land is awfully hard..." he continued. Kimbra interrupted their conversation. "Look, you have NO right to speak to him like that!" Kimbra stepped forward, squinting her eyes, her black fur standing up on her back. "I don't know who you are, but I'm certainly not impressed. If you talk to him like that, you talk to me like that!" she growled. The brute was making his way thought the forest, his body seemed just like a meer shadow as he continued going down the forest. His senses were on high alert since he didn't know where he was and if it came down to fight then so be it. His amber eyes scanned the ground as he stopped, his ears perked trying to catch anything he cold but nothing was around, or so he thought. He continued down the forest path, low branches scraping his black hued fur as his paws were slient on the forest floors, as he avoided anything that would give off a sound and be caught in someones hearing range. He lifted his head up scenting the air, it came as a sudden rush all these scent hit his nose sending his head to snap forward. He continued nimbly down the forest ground towards the scent, he had t find the sources of these scent maybe there was wolves around. Maybe this would be his chance in joining a pack if they would accept him, but most packs denied him because he was a loner. His paws started to pound the ground more harshly as his swift body broke into a jog as he scanned the grounds and his amber eyes ran through the scene before him. Suddenly his ears snapped forward as he came to a sudden hault, they were close. The other wolves were now close and now it was time to introduce himself. He then thought about it for a second, millions of thoughts were racing through his mind. Shoudl he go up to them or should he just back around. He shook his head, he knew this was a chance and if it was a wrong one, well at least was trying to find a new home. His eyes burned at the direction the scents were coming from , it was now or never. Deciding he took a firm step forward placing his paw on a branch on purpse as the branch creaked a loud 'snap'. Hopefully that would have caught the other wolves attention as he continued to make his way towards the comomotion but this time he took his time getting there are his mind still burned with the desire to be accepted somewhere. His eyes caught onto many different wolves as his eyes scanned around as he finally spoke, "Hello" was all he said, "I mean no harm here, my name is Steele and I am in search of a pack" he barked out his voice laced with hope. Bolt stared at the wolf for a few long moments before nodding slowly and turning his gaze back to the new wolf. The Alpha was finally beginning to piece together what the male meant, little by little. The newcomers words made him want to howl in utter frustration and he had to gather a lot of inner strength to keep himself from bristling. The wolf acted tough as he said the words, little care in his tone, but if he knew how much danger he was in of being lit on fire and burned to ash, he probably would of cared. He was about to open his jaw to speak when he saw a familiar dark shape run towards him, and his tail wagged slightly as Kimbra nuzzled into him. He nuzzled her back before looking over to the newcomer, eyes narrowed as he seemed to try to start a conversation with him, asking him questions. He merely bared his teeth in a rather savage way, not dignifying the questions with a response. His ears perked forward as Kimbra spoke, fire in her words, which made him feel less frustrated. At least he had Kimbra to help deal with this cocky wolf. Again he open his jaws to speak but before he heard a rather loud snap, and another male padded forth, instantly making the Alpha male tense before he relaxed at the words that escaped the male's jaws. He already liked this wolf. With a smile he directed his attention towards him, leaving Kimbra to deal with the infuriating male who he was sure to burn to ashes if he continued to talk to him. 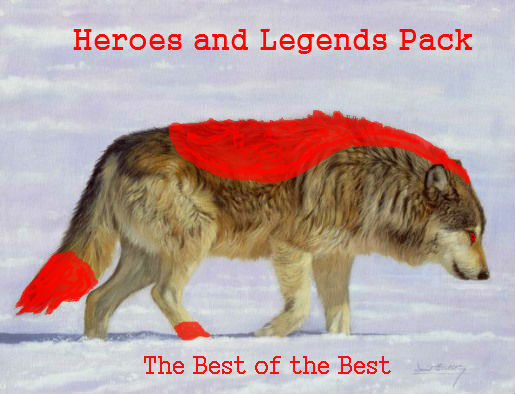 "Greetings, I am Bolt, the Alpha male of the Heroes and Legends pack. If it is a pack you seek then you have come to the right place, but first I need to know how you can benefit this pack?" He questioned calmly, waiting for a response while also keeping an eye on the troublesome male. Colossith eyes widden as a black female arrived and nuzzled the red wolf. He could tell they were mates, which nearly made him feel heart broken for a moment. It reminded him of how Maila had broken his heart by refusing his love. Why was Bolt able to have a mate, but not him? he wondered to himself as he became sommehow fustrated about life. He disliked how unfair the world seemed. 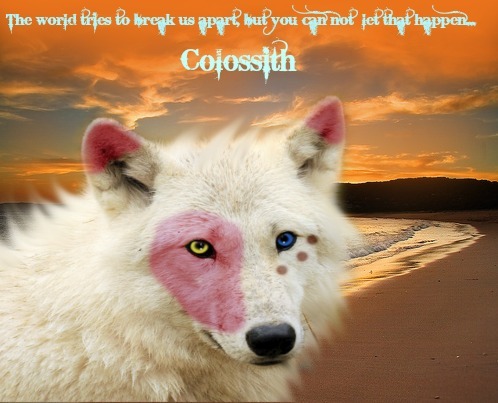 All that Colossith got was bad luck and everything that a wolf wouldn`t want. That thought nearly destroyed him. Can`t the word be fair? Colossith has never done harm so why did he deserve this why? he wondered to himself. The word why couldn`t stop repeating himself in his head and nearly caused him to rage. He didn`t even want to think about it anymore. As it would only make him feel worst. Colossith shook his head before looking up the sky than back at the others, taking a deep breath. Maybe seeing the two being together might rage him at times, but Colossith had to accept it. Maybe he would be lucky like the red wolf, but the chances seems low. Colossith`s attention was turned to the female that had just arrived. She seemed to be the only female around at the moment, which was kind of lame. Colossith opened his maw, ready to say something, but he closed it as he was interupted by the black female. "Look, you have NO right to speak to him like that!" she said seeming fustrated. Colossith rolled his eyes. Were females all like that? Being bossy and rude. That fact annoyed Colossith. He shook his head in disagrement. "I`ll talk to him the way I want, and it wasn`t rude. "Colossith pointed out. He changed his heart broken look, to looking tough again. Colossith was going to reply, but didn`t get the time as the female interupted him again. It nearly got him fustrated. Colossith somehow started to wonder if he`d get an oppurtunity to talk, but it seemed nearly impossible with the female here. "I don't know who you are, but I'm certainly not impressed. If you talk to him like that, you talk to me like that!" the black female growled. "Do I even care if your impressed with it or not?" Colossith said giving a disgusted look. Colossith couldn`t help but laugh. As he realized the female had finally stopped talking, Colossith opened his maw. "And who are you to talk to me this way, huh? "He questioned, giving his serious look. A new wolf came out of nowhere acting a bit too nice. He mentioned about needing a pack, which truely bothered Colossith. Why would wolves want to join this pack? After all it was filled with awkward, insane and brain dead wolves. Was this wolf like the others? Colossith wondered. He looked at the black male with amber eyes, not saying a word as he wasn`t interested in him. At least for now. Colossith turned to look at Bolt. The Alpha didn`t seem to happy. Colossith tilted his head to the left, his eyes laying upon him. "I don`t know...but as far as I`m concerned, I asked you a question and it wouldn`t harm you if you responded, you know? Is it that difficult?" Colossith questioned, feeling a bit fustrated as he wasn`t recieving an answer from the red wolf. Colossith might have been a little rude the way he was talking, but he hadn`t notice it. He felt as if he was talking politely, but it was total reverse. A sudden jealousy appeared on his face as Colossith saw Bolt addressing the newcomer, but not him. That was just totally unacceptable. Was Colossith that bad? After all he hadn`t done anything bad except responding and questioning. At the moment Colossith felt treated like poop, just like his old pack would treat him. They would ignore him or forget his existance and this pack was starting to do the same, which discouraged Colossith. A sudden thought came to his mind. What if his old pack was searching for him? What if they wanted to give him a chance or missed him? Was that even possible? Colossith wonder. For some reasons Colossith had forgotten about the other wolves being around him. At the moment he was just so concentrated at his thoughts, but he was also curious. Curious of whether his pack was happy about his left or if they were dissapointed and missed him. Colossith shook his head. His old pack was past and now he had to stay in the present. He had to forget about it and now. This wolf was starting to get on Kimbra's nerves. He was too sarcastic, too witty, too negative for her. A new wolf approached the group and Bolt left this rude wolf to speak with the new wolf. He gave a rude comment and couldn't contain his laughter. Kimbra rolled his eyes. "I am an Alpha and I certainly don't like your attitude. Where are you from?" Kimbra growled. Her powers would certainly help. If the wolf even thought a bit about anything, Kimbra would be able to pick it up. This was something the wolf had no idea about. Steele's eyes went from the one that spoke, his soon to bee alpha as he stated. Steeled dipped his head in respect his amber eyes trained on the Alpha name Bolt. A warm feeling erupted into his body as he heard that he had come to the right place to join a pack, he couldn't help but smile as sigh a relived sigh as he watched alpha with respect in his eyes. He seemed like a wise leader and maybe this would be a turning point in his life. Maybe he would finally be accepted and he could do something for his new pack. He flicked his tail ahppily as he then perked his ears hearing the Alphas words, his thoughts pondered in his head as he thought about how to answer his question. Sure Steele had skills but what if they didn't approve of him, confidently he then spoke. "I assure you that your pack won't go a day with food" he said proudly, "In my old pack I had the best of hunting result and would make sure everyone had food escpecially the alphas since they eat first" he said responding and was clearly knowledgeable about packs. He thought for another moment before speaking, "I also know how to fend off a trespasser" he said seriously this time, "And I assure you if you accept me into you pack I will risk my life to any trespasser who dares to enter these grounds of yours" he said. His black fur bristled hearing the other brute speak, if he were to speak his mind right about now it wouldn't be pretty. He eyes the other male his blazing amber eyes narrowed. A flash back came to his mind as it reminded him of the omegas that chose to speak rudely and harshly to the alphas. Alphas are to be the most respected and thats how he grew up with that carved into his mind. If anyone in his pack decided to lash out or misjudge an Alpha, it didn't end niceless. He was quite surprised the Alpha hadn't already pinned him had given him a warning to leave or something along those eyes. His eyes trailed over to the female, instantly he knew she was Luna of the pack meaning his mate. He watched her with interest her fiery tone lashing out at the rude brute. A smirk hit his muzzle the alpha had chosen well since she had the attitude to clam a group of wolves all at once. He sighed missing pack laugh.. his pack life in particular. His eyes dirfted around as he couldn't stand that wolf anymore. He closed his amber eyes trying to calm himself. He wasn't part of the pack but just seeing that wolf act high and might just made his fur bristle. As he looked back at the alpha then at the brute he shuffled his paws, he already felt safe here and was hoping to get accepted his ears were perked waiting and anticipating those words that he was going to be accepted. Out of the corner of his eyes he caught the other brute look at him momentarily he narrowed his eyes lashing his tail angrily. As he heard yet again the female speak, his assuptions have been correct she was alphess of this pack. He smiled faintly and shuffled his paws once again trying to calm himself he told himself over and over that he should let the alphas handle it their way but he couldn;t stand him direspecting them.. was he never taught to respect an alpha and was he never put into his place if he ever direspected one? He shook his head and peered back at the alpha expectantly as his muscles tensed but once again he relaxed he had to focus on himself and getting himself to find a new home, this was probably a rare chance to find the forest and he was going to take it. He was tired of wandering around, his paws were cracked but he was well feed because of his hunting skills, he had learned that anger was the best to hunt but not to be near anyone. He peered around still waiting he didn't know why he had a nervous feeling in his stomach.. was the fear of rejection? or was it the fear of not being good enough? he tilted his head waiting, anticipating while he was deep in thought. Suddenly all these negative thoughts came flooding into his head. He tried brushing them off by every moment he waited for the Alphas response they grew and they were bugging him he looked up at Bolt with hopeful eyes respect he so longed to be in a pack and if he had to prove it, so be it.